An example of a pipe that Reclamation is seeking innovative methods and technologies to detect leaks and flaws.To find new, innovative ways to identify leaks and flaws in large diameter buried pipelines, Reclamation launched a prize competition in 2018. After an extensive review, four winners were selected to share $75,000 for their novel solutions. More than 20,000 miles of buried pipeline supports the Bureau of Reclamation's mission of delivering water to its various water users. Much of this inventory includes pipelines with diameters larger than 48 inches, comprising a variety of pipe materials. As the pipes age, they are increasingly susceptible to leaks and flaws, and there is currently no single technique or tool to precisely determine how bad a leak is and the location of a leak or flaw in a specific pipeline. Timely leak detection allows water managers to better manage maintenance requirements, conserve scarce water resources and increase the reliability of service to clients. Chiron K9, LCC, received $25,000 for their solution to use trained canines to “smell” tracer materials, for example chlorine, that has permeated through the ground adjacent to leaks. The ability of trained canines to detect water pipeline leaks has been demonstrated in other countries. 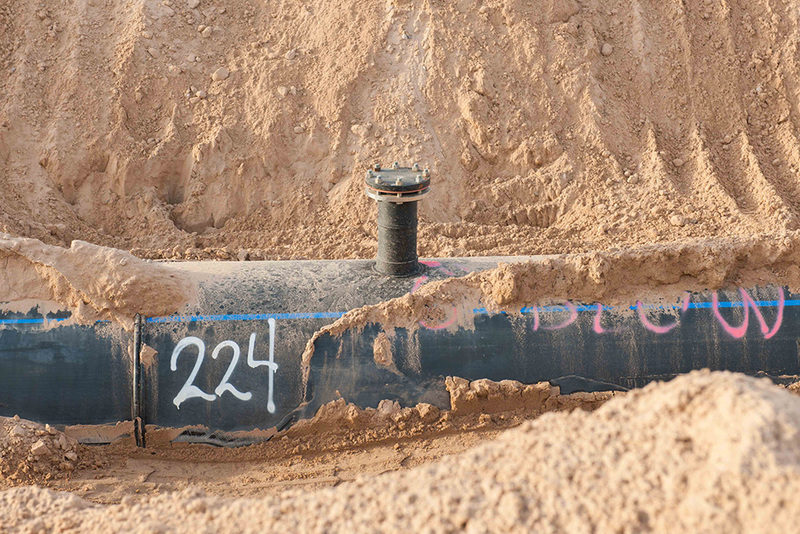 This technique holds promise for implementation on long, rural pipelines in Reclamation inventory with minimal impact to operation. Edem Tsikata, Ph.D., received $25,000 for his solution proposing the use of a "soft robot" that would detect pressure differences and surface anomalies on the pipe interior to indicate leaks and flaws. The robot would consist of a flexible ring of pressure sensors, LiDAR scanning equipment, and an odometer, all controlled by an on-board computer. The proposed robot would be inserted into the pipeline and auto-adapt to navigate pipe features such as bends, joints, and diameter changes. Eric Hinterman received $15,000 for his proposed solution to use a swarm of neutral-buoyancy active Radio-Frequency Identification tags that would be injected into the pipeline water flow; some would subsequently exit through leaks while the rest would be recovered from the water stream. The tags that exited at leaks could then be detected from the surface to pinpoint the leak location. This technique would be flexible for all pipe materials, diameters, and features. Bretton Holmes and Cliff Edwards received $10,000 for their solution using a drone with Raman LiDAR sensors to detect tracer gas that would exit through pipeline leaks. This technique is promising for assessing Reclamation pipelines in remote areas with rough terrain. Reclamation partnered with the San Diego County Water Authority, Southern Nevada Water Authority, and Isle Utilities for this prize competition.